It is said that weddings are made in heaven. Yes, it is true, but it is we , who make them a special moment. A moment to treasure and cherish for the life time. The stage is set and the partners are ready. The date is also fixed. Lots of things are to be done. What is the first step towards making the union a truly special one? Letting the world know that two loving souls are becoming one. What can be the best way to share the happy news with the world? Send personalized invitations to your near and dear. Now a days you can get a range of elegant and stylistic invitations in an array of colors, designs and fonts through online wedding invitation sites Browse through the gallery and choose from the amazing selection of Luxury, Royal Scroll, hardbound and Designer Invitations. Shop carefully through the selection of cards displayed and find a design that suits you. If you are not able to find the right one, there are custom designed templates for the users. Most online sites even offer design consultations and invitations at huge discounts. When it comes to weddings, Indians love it to have big and fat weddings. 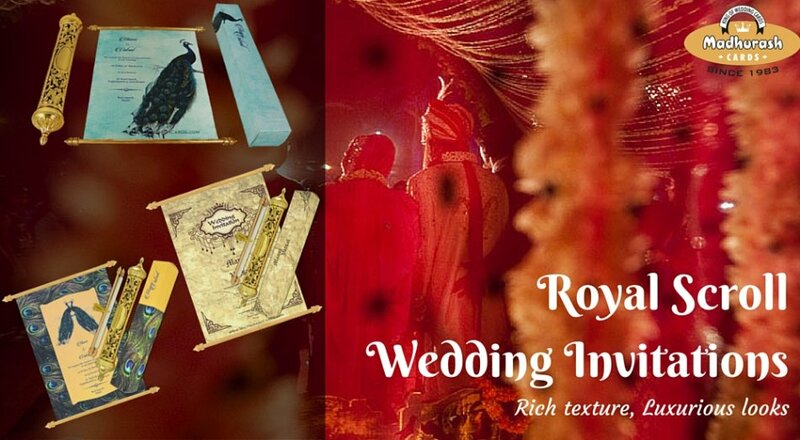 So make your weddings truly big and special with Luxury invitations. These invitations have a classic style of their own with luxurious soft material and design. No matter whether you are choosing a simple style or a luxurious one for your invitation card, a laser cut design can make all the difference. Laser cut invitations are the trend today. These invitations are created by the most modern and sophisticated laser cutting technology. Available in an array of beautiful colors and designs Laser cut invitations helps you to showcase your style in a unique manner. For those who want to caste an everlasting impression in the minds of the people, Hardbound invitations Cards are the best ones to choose. Created exclusively in the style of book with a hard cover made up of quality material and luxurious finish, these invitations speak volumes about themselves. From time immemorial, people have been fascinated by rich texture, luxurious looks and ethnic designs. These were a monopoly of royals till some time ago. 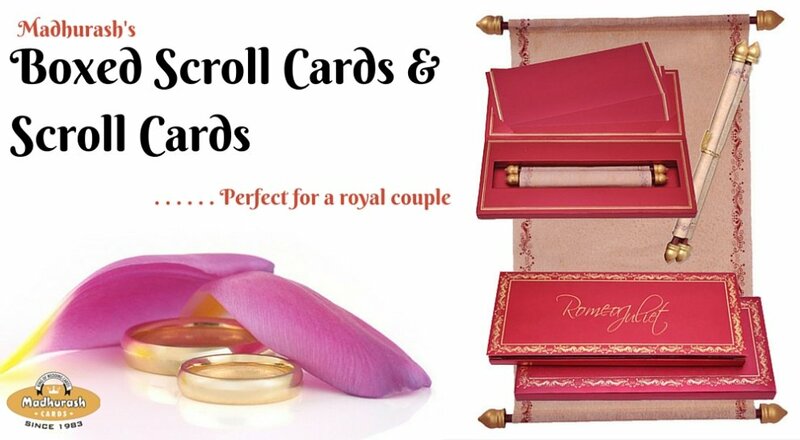 Royal Scroll invitations Cards and style with intrinsic artworks, perfectly handcrafted to make the day a special one. In the scroll invitations, you will have a beautiful cover and inside it will be the invitations. Not able to find the right card? All you have to do is to Choose a wedding invite designer or a website. The experts can help you to have a customer made Designer Invitation Cards. Wedding invitations sites have a team of wedding card experts and designers who have an eye for detail. Choosing the right material, font and color they weave out the perfect card for you which will turn your guests spell bound. Exclusive Designer Invitations truly sets you apart from others. Whatever type of invitations you choose for sharing your happy news with the world, let the invite be a signature of yours treasured in the minds of the people. 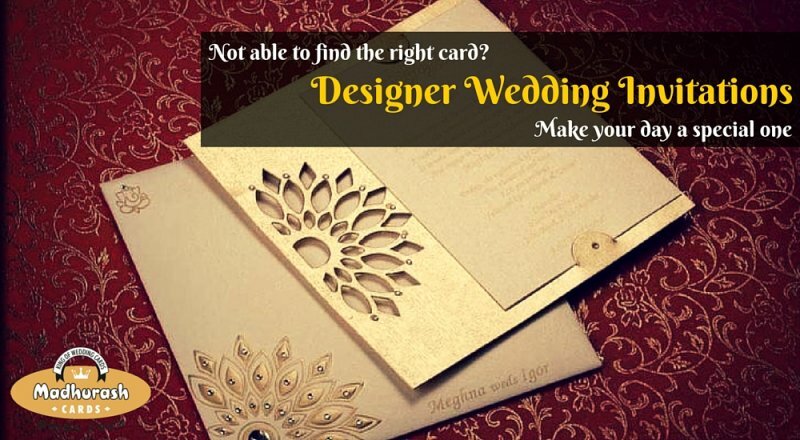 Explore different types of wedding invitation cards from Madhurash Cards. 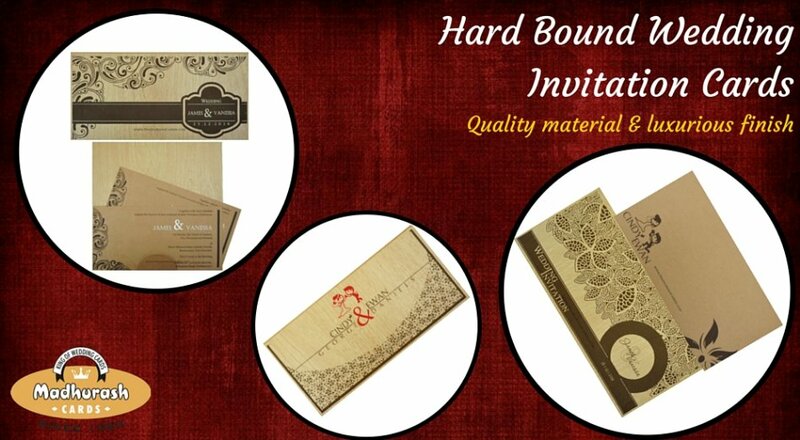 Stylish varieties and Designer Wedding Invitation Cards that make you occasional memorable and joyful. 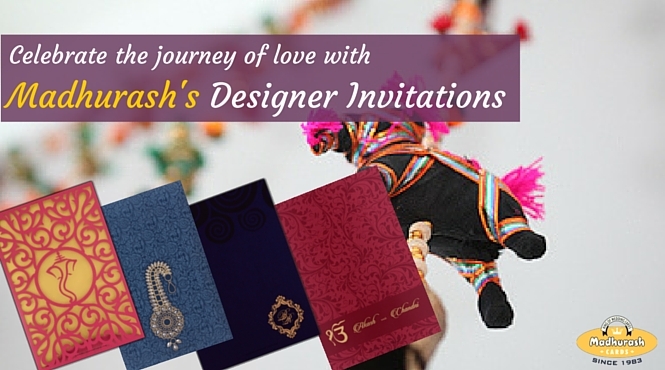 2 Comments on "Celebrate The Journey Of Love With Designer Invitations By Madhurash"
blog posts. After all I will be subscribing to your rss feed and I hope you write again soon!